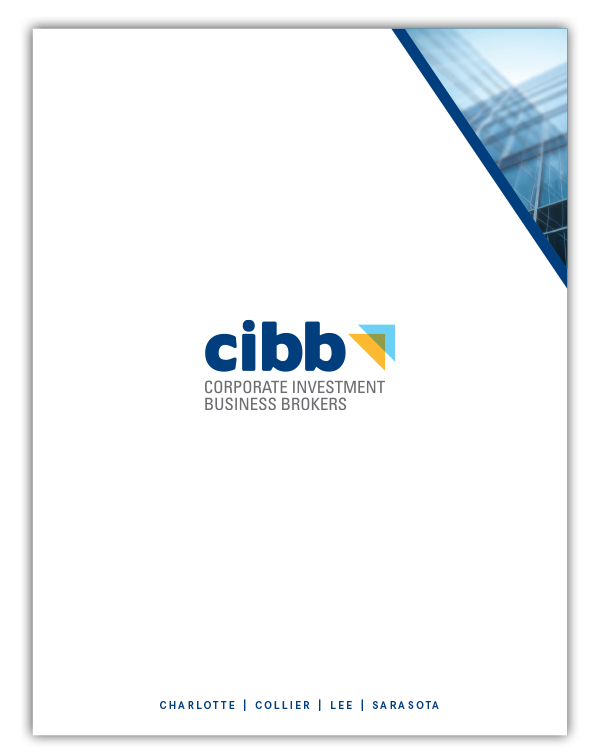 Corporate Investment Business Brokers (CIBB) is a full-service brokerage firm that specializes in business sales and purchases across a diverse range of industries. The firm, based in Southwest Florida, was founded in 1986, and has structured over 3,000 business sales and purchases with a total sales volume of over $1 billion. The firm, growing steadily and recently expanding its team, was ready to advance to the next level, while positioning itself for future long-term growth. 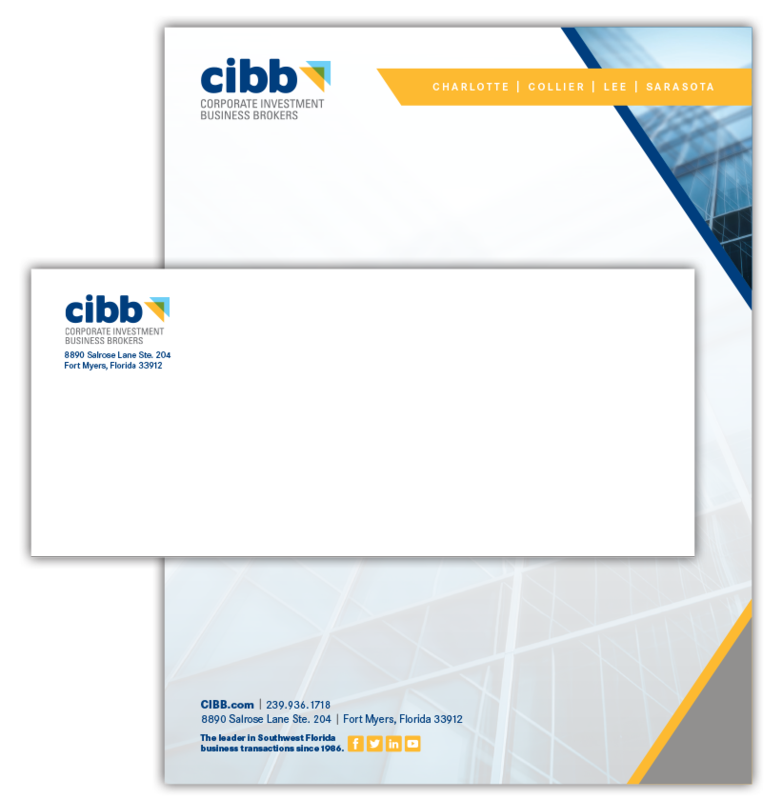 With the current brand having been in place since its inception, CIBB engaged Spiro & Associates to develop and execute a brand evolution campaign that would elevate the firm, as well as support the growth of the company and its vision for the future-—all while allowing it to stand out from others in this highly competitive industry. The Brand Architects™ at Spiro & Associates went to work right away, developing a campaign that would evolve the brand, build on the firm’s existing, stellar—but aged—image, and create a contemporary look and feel. First, the Agency designed a new logo that brought a sharp visual identity into focus, characterizing the brand as bold, smart, effective and original. The arrows in the logo represent growth, forward movement and progressive thinking. Other campaign materials were also created, including an evolved website, corporate brochure and whiteboard video. 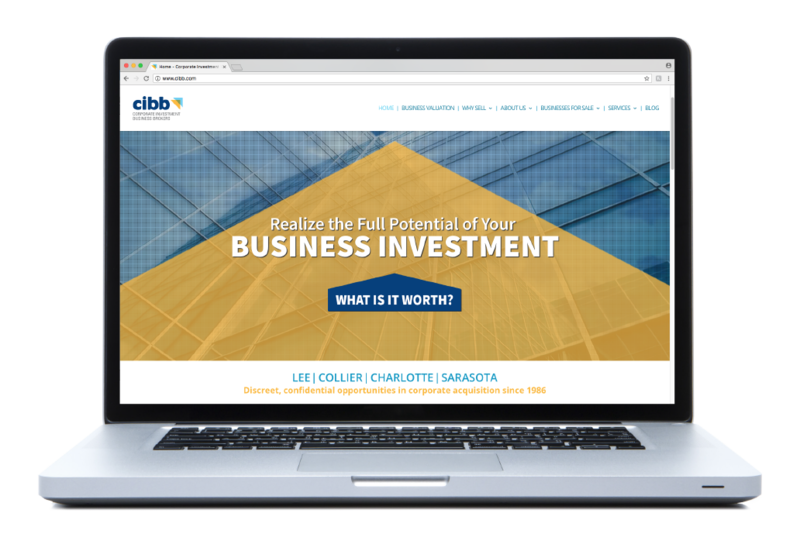 Following the creation of the logo, the Brand Architects did a complete overhaul of the website to bring CIBB into the 21st Century. Exhibiting a contemporary feel, the website incorporates bold text with bright colors of blue and gold. 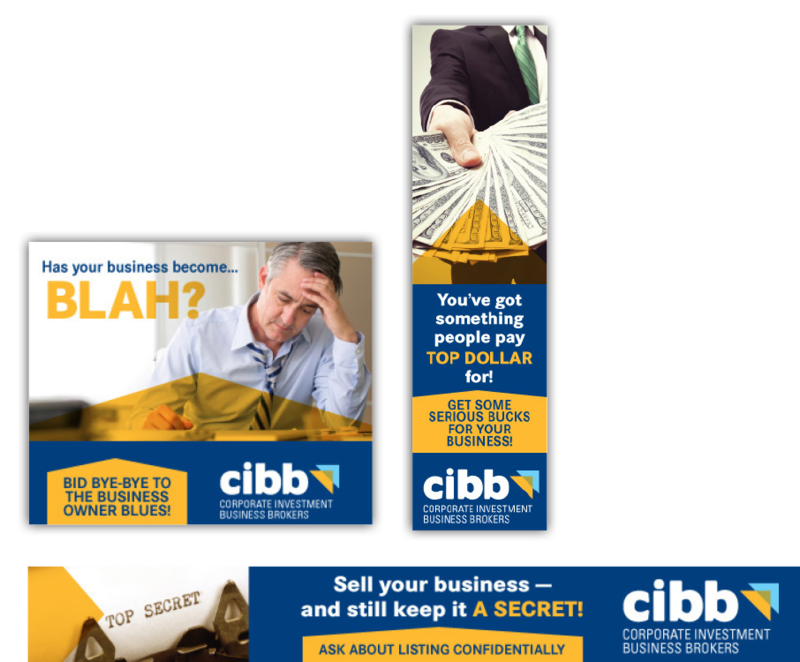 A static hero image of a business bursts onto the home page with text that starts to effectively define what CIBB specializes in. The evolved web presence elevates the company’s focus on structured business sales and purchases. 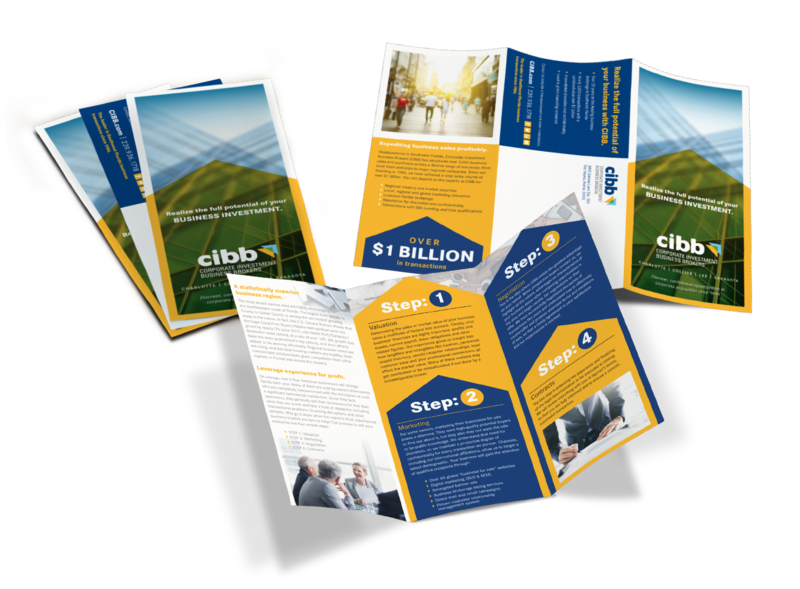 Capitalizing on the newly evolved logo, a corporate brochure was developed to attract CIBB’s target audience-—business owners wishing to sell their business or those who are looking to purchase a business as an investment. 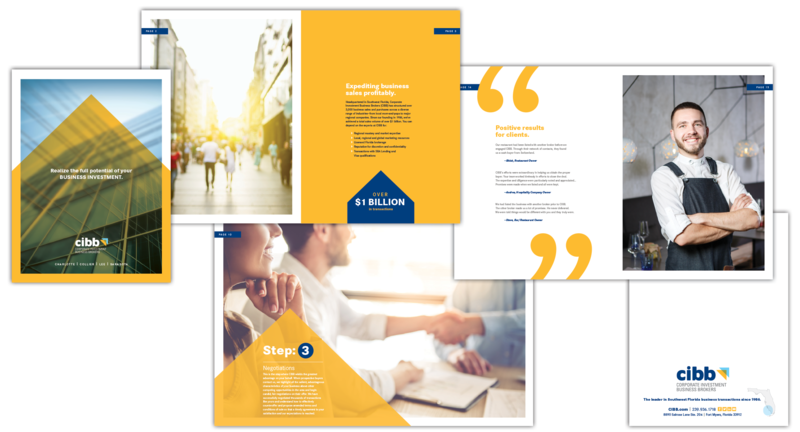 The brochure leverages the company’s 30-plus years of industry experience and creatively captures the successful four-step process the firm uses to help sell clients’ businesses. step-by-step process for successfully helping clients and meeting their needs and expectations. 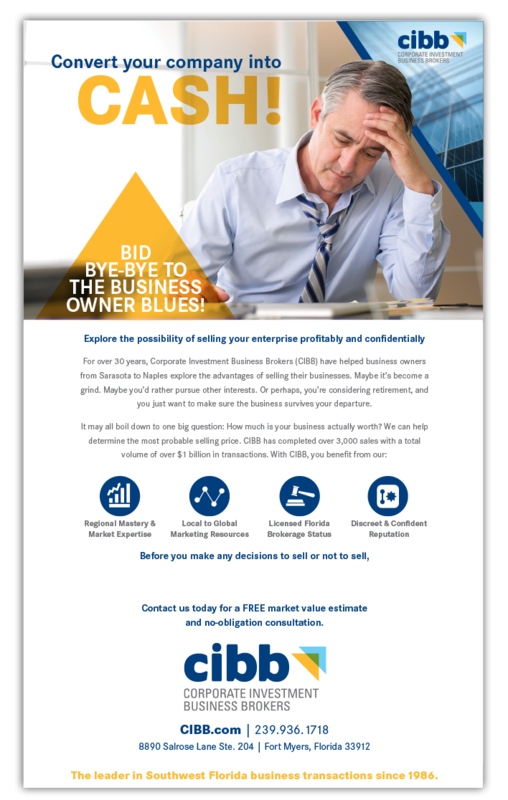 Steps included assessing the condition of their business as a sale prospect, determining their business worth and understanding the tax implications of the sale proceeds, just to name a few. Other elements contained within the campaign included stationery, banner ads, eblasts, social media advertising, and digital and print media, as well as public relations materials – press releases and blog posts. The campaign launched with a strong and successful start. 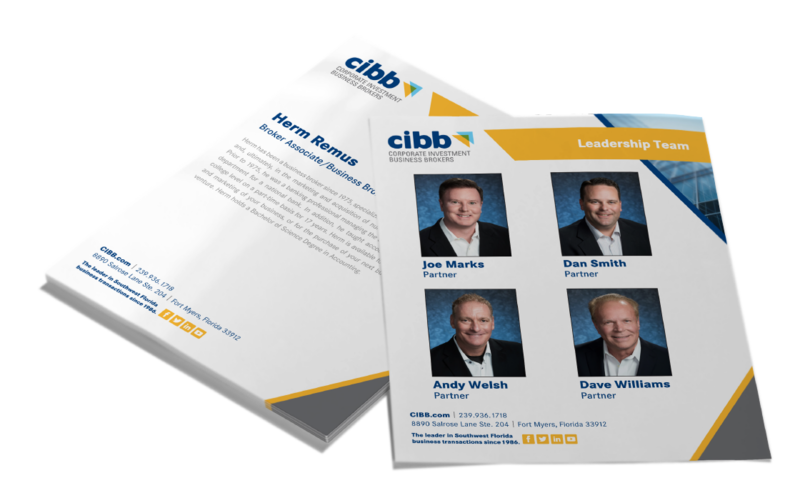 In the short time the campaign has been active, CIBB’s brand awareness is growing and continuing to position the company as the area’s leading business brokerage firm, while its social media following has increased exponentially. 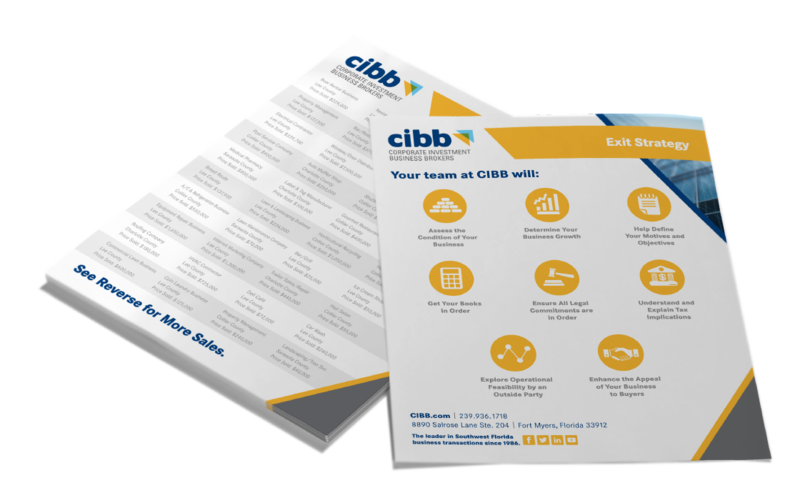 The corporate brochure is being utilized to successfully promote the business with clients and potential clients on a daily basis. The whiteboard video has had a tremendous amount of views, leading to many requests for a broker consult.